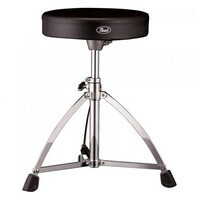 The Pearl D-730S Drum Throne is a short but comfortable and reliable drum throne featuring a round vinyl covered cushion and a sturdy single braced tripod with rubber feet and a slip-proof height collar. This entry was posted in Pearl and tagged Drums-and-Percussion. Bookmark the permalink.